Presented in this posting are the analogies between String Theories and I-Ching Logic within their respective dimensions. 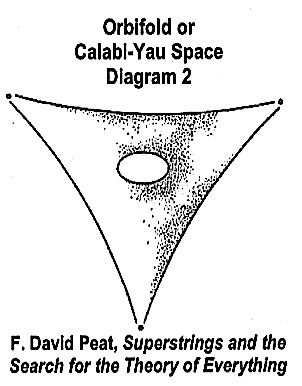 The dimensions of String Theories are computer-executing dimensions in the Information vacuum of hyperspace. On the other hand the I-Ching logic dimensions represent the pre-encoded Logic-Information potentials inside the participatory universe’s self-programmable computer. The former generates the dimension of the Information-Energy Vacuum, while the latter represents the pre-encoded Logic-Information Vacuum dimensions. The analogy between the two sets of dimensions will be illustrated. Let us begin with these particular Vacuum Holons shown below. The above is one of the many Holons that define the vacuum in relationship to one’s left-right brain frame of references depending on the particular Observer. The following are two more. Now, let us examine the three components of Holon (a). The logic of the 64 hexagrams formed by 8-trigrams is also a 248-dimensional structure. As shown, the 64-hexagrams is reducible to a set of 36 mirror hexagrams (27 reversible & 7 irreversible). 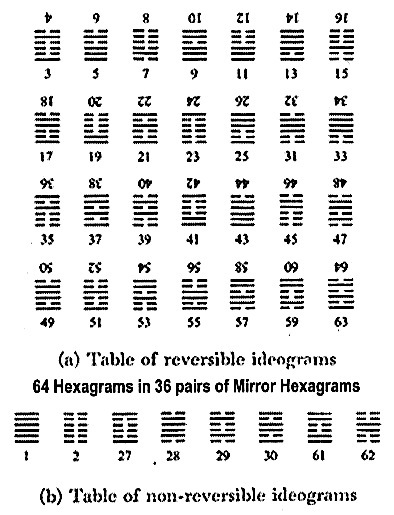 The 248-dimensions of these 36 mirror hexagrams are: line-dimensions —-> 6 x 36 = 216, free will dimensions —-> 31 (in picking trigrams within the 27 reversible hexagrams plus hexagrams 27, 28, 61, and 62 = 27 + 4), and, 1 conscious dimension 神 or 靈. Thus, the initial-final conditions of the universe are apriori encoded in a set of computer programs describing the 64-hexagram formations from an 8 x 8 matrix of trigrams and their symmetry breaks. The execution of this apriori set of programs, according to some physicists, is a set described by the matrix E8 x E8 symmetry breaks. Because logic into information is a one to many mapping, the correspondence between 64-Hexagrams and E8 is a one of many correspondences between Spirit (in Logic) and Soul (in Wave information-energy of becoming something). This mapping is observer dependent and this something is an information-energy object collapsed into the space-constant grid specified by the energy-mass output module. Mapping of 64-Hexagrams into E8 in 10-dimensions of yin-yang-neutral lines represented by open-closed-connected strings, the observers are mathematical physicists. Another mapping is between Hexagrams formed by Acu-Points arranged in pre-post octagons and Human Chakras. The E-8 mandala, in this mapping, is the Chakra-8 mandala at the final stage of human evolution as ascended humans. This mapping represents the universe’s initial tri-state 1-2-3 & the universe’s final tri-state 7-8-9. Notice, Chakra-8 is an integrated state of knowingness and thinking. The purpose of bio-quantum technology is to provide a platform for understanding the Human’s capabilities of becoming a non-local co-creator. “This orbifold space consists of a torus with three special, singular points. Like the torus, it is a 2-dimensional surface in a 3-dimensional space. By combining 3 such orbifolds together, it is possible to generate a 6- dimensional space with 3x3x3=27 singular points. 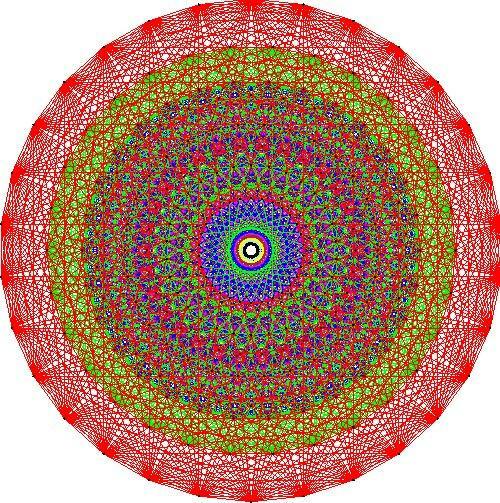 Such orbifolds are used in string theory to represent the space generated when the original 10-dimensional space compactifies. In I-Ching, number 36 is the number of hexagrams in the symmetric set of 64 hexagrams. Thus, in the vacuum computer, within the entire set of subroutines and programs, there are 36 executable subroutines and programs that describe the elementary particle world, while there are many more entangled nonsense subroutines and programs. In the Gnosis, Truth is ADHQEIA, whose number is 64 and that there are some of the 64 components visible, and some invisible to the human. All that are visible of the 64 are 37, leaving 27 hidden. Most vital, in regards to informed knowing, is the input set. In I-Ching, this set has 27 coordinates: 12 terrestrial, 10 celestial, and 5 system coordinates that correspond to the state of information in question. For example, a particular time in these 27 variables correspond to 8 celestial-terrestrial coordinates plus 5 system-coordinates (i.e., 5-elements) in the form of trigrams that define the pre- and post heaven octagons. These 27 non-local coordinates have a correspondence to the 22 Hebrew letters plus 5 finals, which can be use to map words (perhaps their vibrations) into numbers in inner space. This vibration is in Set 0 to 36 spin octaves, namely the co-creation set. Perhaps this is how the compiler works: By converting the vibrations of words into number psychologies and their interacting frequencies, which in turn reducible to beauty—simplicity—least action. In this analysis, the 3 orbifolds form the key. The 36 subroutines-programs represent the lock. Knowing involves with key finding the lock, fitting it, and opening it. Key fitting the lock implies a reduction of the key plus the lock dimensions into one lock-key dimension, which is a form of compactification. In diagram 3, Tony Smith unify the dimensional equivalents of elementary particle-Plank physics in 8 dimensions Lie and Clifford algebras, Cl(8), with I-Ching binary and Tai Husang Ching ternary dimensions plus other ancient dimensional models. Diagrams 1-a, 1-b, 2, and 3 illustrate the information dimensional equivalent between string/M-theory and I-Ching logic-information. As shown in diagram-3, Tony also indicates that this dimensional equivalent applies to the Torah, the tubulins-neurons Casimir effects in the Brain, IFA (Indigenous Religion of Africa), and other ancient developments. 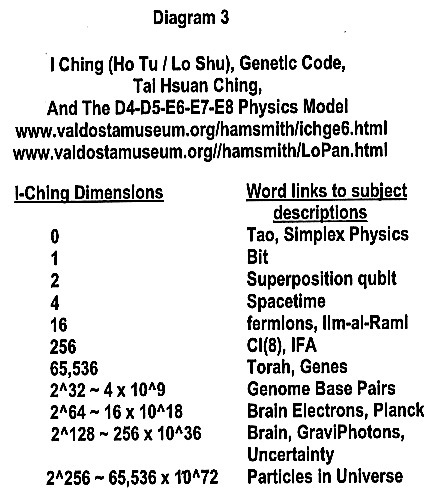 The conclusions found by Tony Smith on dimensional equivalent of cultural knowledge and Stan Tenen (at the Meru Foundation) on the equivalent of 27 Hebrew letters formed by projective geometry and hand-gestures (in a state of human knowingness) support the validly of the Matter-Being Holon Paradigm, which is an integrated synthesization of cultural knowledge and directly connected to the 10-27 formula derived in previous postings. (See websites & links) In Being, there are no identical observations (knowing & thinking), identities can only be seen as equivalences, correspondences, or correlated via mappings, rather than in the form of equality equations. Furthermore, the frame of references is in the mind of the observer, while pointer readings are statistical observations of the eigenstates in 3-D collapses. In short, D4-D5-E6-E-7 like strings and M-theory is not nonsense, but it is an observer(s)’s reality of becoming in Set-3 [72 to 108] octaves, while the Holon Theory is a synthesis of Octave Sets [0 to 36]—[36 to 72]—[72 to 108].